Dogs as a catalyst for healthier happier city? I am again dog sitting for friends and learning more about the how cities need to evolve to the every changing needs of the people who live in them. I am not a dog owner, but I am fascinated about how dog ownership has changed since I had a dog 50 years ago. Just had a wonderful conversation with a man who told me getting a dog has significantly improved his and his wife's life as they get out and walk more. Another couple told me how they love coming to the dog park every night just to watch the animation. The lady said "it is like Disneyland for dogs." 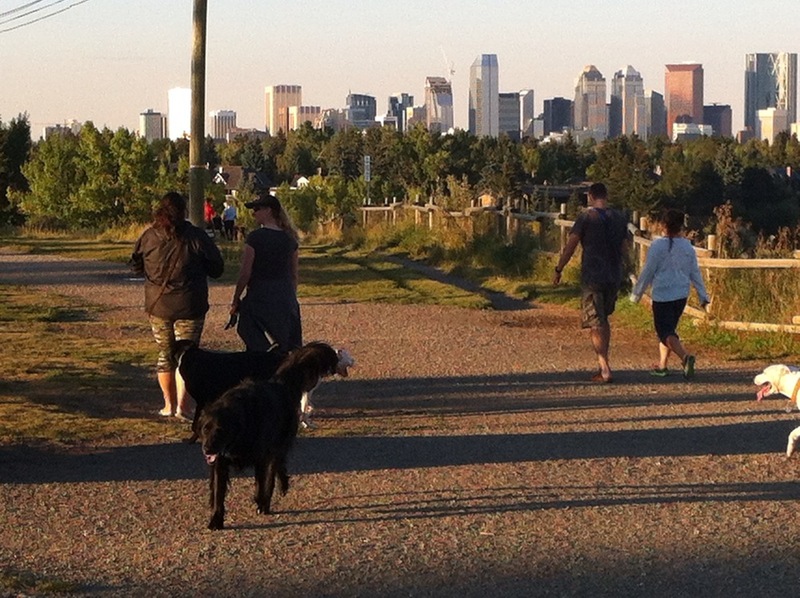 A summer evening stroll in the dog park is enjoyed by people and dogs of all ages and sizes. Indeed, the dog park is as important to the humans as it is to the dogs. In our urban mostly sedentary lives we need a reason to get out and walk. Every time I dog sit I find myself saying "I must get up in the morning and just go for a walk to my neighbourhood dog park - I don't need a dog." But, I never do it! The dog as a catalyst for healthy living will become even more important with our aging population. Seniors perhaps benefit most from walking a dog, not only for the physical exercise, but the people contact. It is not very often that I go to the dog park that I don't chat with someone. It isn't a long conversation, and I don't think I will meet my next "new best friend," but it is a nice friendly chat. This is why dog parks are better for socialization (dog and humans) than just walking your dog on the street, as there is a much greater probability that you and your dog will interact with others. And, isn't that what is great about urban living i.e. interacting with others. Not sure if it is just me, but people at the dog park seem happier and friendlier than people in the streets. What's with that? Below is an article I wrote back in 2007. I am now thinking it is not just downtown that needs to be more dog-friendly but the entire cities. In fact, I am now thinking that all new communities should have a dog park as a key element of their master plan. It is a great way to meet your neighbours in the new urban world. The dog park is the the new town square - all urban villages should have a dog park! The dog park is used seven days a week year-round, unlike playing fields and many non dog parks. The dog park is as important to many, as the recreation centre or library is to others. Everybody needs a drink after a long day and a good walk. Downtown needs to be more dog-friendly. This blog was originally published in the Calgary Herald's Condo Living section March 3, 2007. It always amazes me who is out walking in the coldest, darkest days of winter. It is largely people out exercising their dog or dogs. Even in the dark at 6 a.m., when I’m heading to work, there always seems to be someone out walking his or her pet. As a non-dog owner, the increasing importance of dogs in our contemporary urban culture continues to amaze me. I think this is especially true for groups like the young professional and empty nester cultures — which, coincidentally, are also the primary markets for urban living. I guess it shouldn’t be surprising then that we are seeing more dogs along our urban side- walks and pathways and in our parks and plazas. 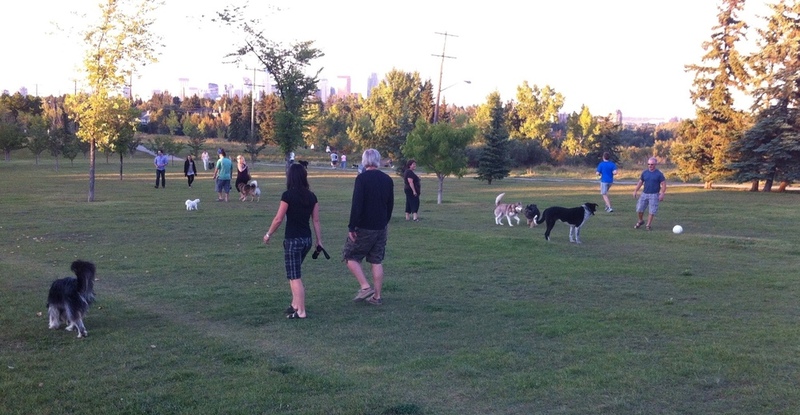 Literally thousands of Calgarians are in dog parks every evening walking their dogs and chatting with fellow citizens. In its 13th annual housing survey conducted by Ipsos Reid, RBC Royal Bank said last year that 56 per cent of Canadians have pets in their homes. Experts say that probably works out to about five million dogs and seven million cats. The total market size of the Canadian pet industry was estimated at $3.8 billion in 2001. City officials have estimated there are as many as 100,000 dogs in Calgary. As many as 2,000 may use the Southland Natural Park area alone on busy days. “Pets are the new children. It’s the bottom line,” said Michael Bateman, of Chasin' Tails, a Calgary doggie day-care centre, in a recent Herald story. Such centers offer everything from overnight boarding to boutique areas. In some ways, dogs are to urban living what children are to suburban living. I appreciate that owning a dog in an urban centre presents a unique set of challenges. How is housebreaking accomplished in a high-rise building? Where and how can a large, energetic dog be exercised? How can a dog be taught to ignore distractions such as traffic congestion and noise, crowded sidewalks, bicycles, roller bladers, interesting trash, back alleys, roadways — and, of course, other dogs? One solution occurring in places such as Atlanta, Houston, Dallas and Phoenix (who knew these were hot spots for urban living?) is the creation of “bark parks.” These differ from “off-leash” areas in that they are parks solely for the use of dogs and their owners. They are often small parcels of land that are too small for development. They are fenced off and self-governed by a set of rules, much like a daycare (for example, dogs must behave, dogs must be accompanied by an owner, dogs must be healthy and owners must clean up after their dogs). Some bark parks also have playground-like equipment for dogs to jump over, climb up and so on. Though Calgary has over 300 “off leash” areas — which may be the most of any major city in Canada— it, to my knowledge, has no “bark parks.” But you have to think someone is working on a “bark park” in Calgary! Current policy in Calgary is “if there are no signs indicating it is an “off leash” area, assume it is strictly an on-leash only park.” It is also surprising that I haven’t yet seen a Calgary condo listing that promotes dog- friendly amenities. I have seen it many times in Vancouver listings, including one, which read, “just steps to George Wainborne Dog Park, Seawall and Granville Island.” It was amazing to me that not only did the dog park have a name, but that it was listed ahead of two of Vancouver’s biggest urban living attractions. I am wondering when the first Calgary condo will be built with its own mini “bark park” on site — maybe already one exists? While “bark parks” and “off leash” areas are great, there is still a need for both dog owners and non-dog owners to learn to share our public spaces including sidewalks. As a non-dog owner, I didn’t appreciate the importance of off leash activities until I started to do a little digging (no pun intended). I didn’t know “off leash” time is important for dogs to learn to socialize with humans and other dogs. I didn’t know it makes dogs less aggressive and helps reduce neurotic activities such as barking, two benefits which are in the best interests of non-dog owners. There is also research that says dog owners are more physically active than non-dog owners as they are more motivated to get out every day and take their dog (or dogs) for a walk. I learned there are now “woof and hoof ” outings where dog owners get together on a regular basis to walk their dogs and chat about life (sounds like the Running Room’s programs for joggers and walkers). It used to be that urban planners were primarily interested in making urban areas more pedestrian-friendly places, but now they also have to ensure they are also dog friendly. As a Calgary urbanite for 20 years, I have certainly seen this evolution happening on my street, in the park across from my house and at the “off leash” area a few blocks away. RJ writes: 100, 000 dogs in Calgary alone huh? I can believe it, maybe even more....I'd say at least one in every ten homes has a dog. Now what we need is playgrounds built within a dog park (none that I have found)....if I could run both my four legged and two legged children at the same time that would be awesome! Ann Toohey, PhD student, Community Health Science, University of Calgary writes: My MSc research indicated that older adults (+50) who walk their dogs 4 times/week or more had a higher sense of community than those who walked their dogs less frequently, or non-dog owners. And of course they were much more likely to get 150 min/week of moderate, neighbourhood-based physical activity (as per public health recommendations). For more information on Tooley's MSc research. Calgary: A leader in address urban issues?